In 1987, I heard a really funky song on the car radio. It had a catchy chorus, great vocals, and was incredibly well produced. In a few short minutes, it delivered that ‘wall of sound’ feeling that got right inside me. The radio DJ announced that it was a single released from the new album by Robbie Nevil, an American I had never heard of. I went into my local record shop, and asked about it. I was told that it was only available as a single at the time, and was already in the Top 40. I bought a copy immediately. Once home, I played it over and over, as it seemed to get better every time I heard it. This was very much my kind of music, and I was looking forward to see it climbing the charts, and appearing on TV music shows. When it got into the Top 20, (eventually reaching number two in the UK) I saw Robbie performing it on television. I was suitably surprised. Instead of a smooth, sharp-looking young black man, here was a skinny white guy, with long hair like a rock performer, and a totally different image to the one I had stereotyped. Robbie continued to record for a while, and had a couple of lesser hits. But he never repeated the success of this great pop song. And I never did get around to buying his album. 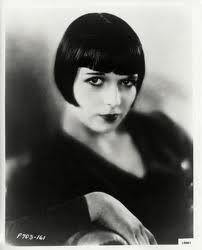 For some reason, I was thinking about Louise Brooks again today. So, here is a totally random post about female hairstyles. Since my teens, I have been fascinated by that beautiful star of silent films, her turbulent life, and captivating 1920s style. But mostly, it was all about her hair. Nobody has ever carried off a bobbed hairstyle with such allure. It was so famous, it became her personal trademark. Then in 1985, along came the wonderful British group, Swing Out Sister, fronted by the lovely Corinne Drewery. I thought their songs were great, and then I saw them performing on TV, and was taken aback. I knew immediately where I had seen that hairstyle before.